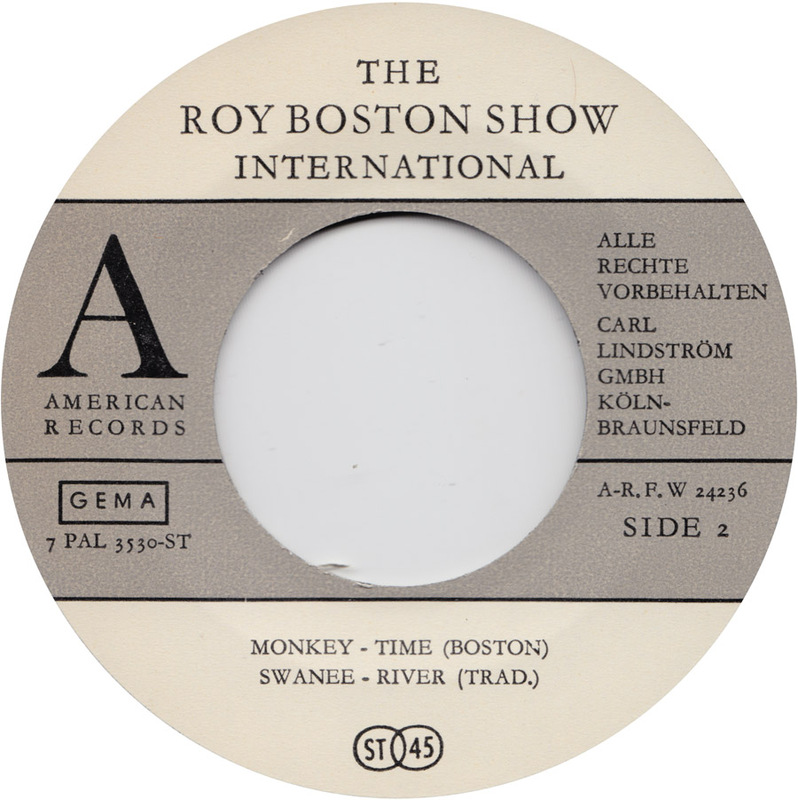 Roy Boston is mostly know for his Schlager songs of the 70s, but apparently he already led his own “show band” in the 60s. 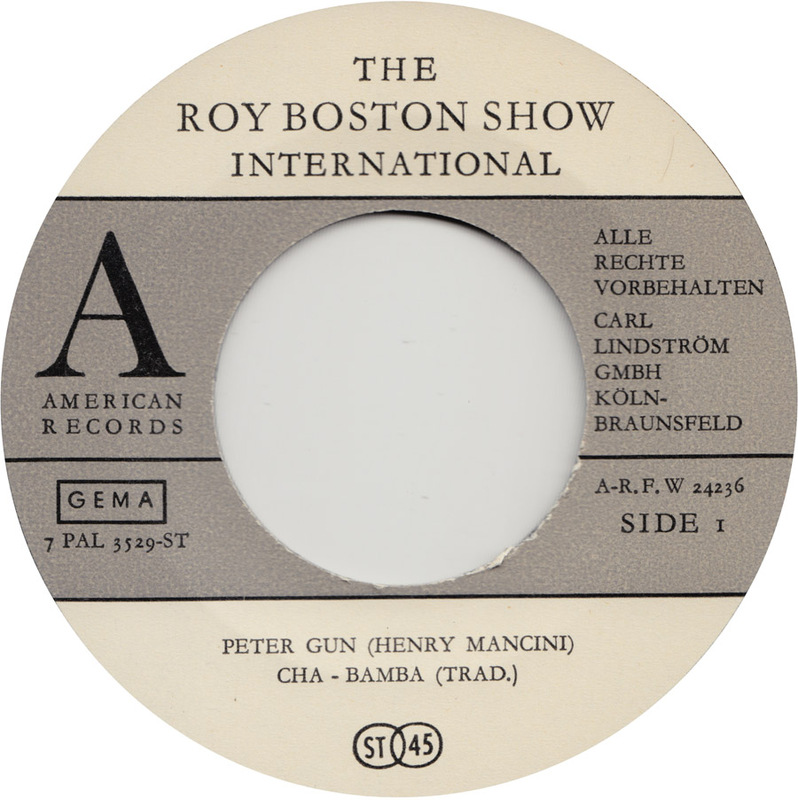 This is part 2 of his “American Records” label (located in Düsseldorf!) releases , so I suppose there is a part 1 too, but I´ve never seen it. 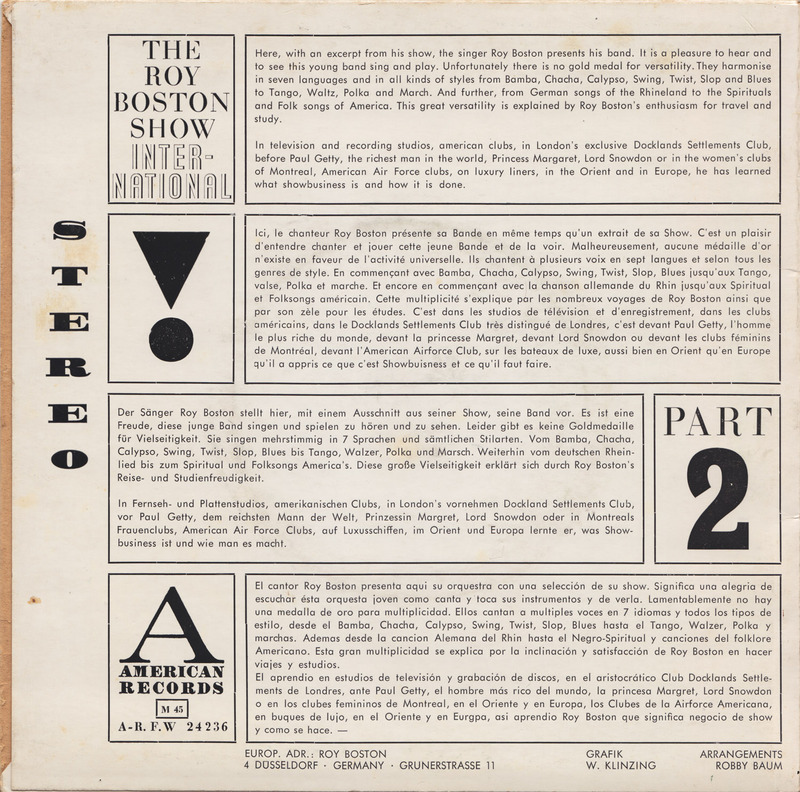 Roy Boston seems to have had an appetite for travel and luxury even as a young man. He went on to become a building tycoon in the Souh of Spain. Today there is even a street named after him in Marbella, the Calle Roy Boston. 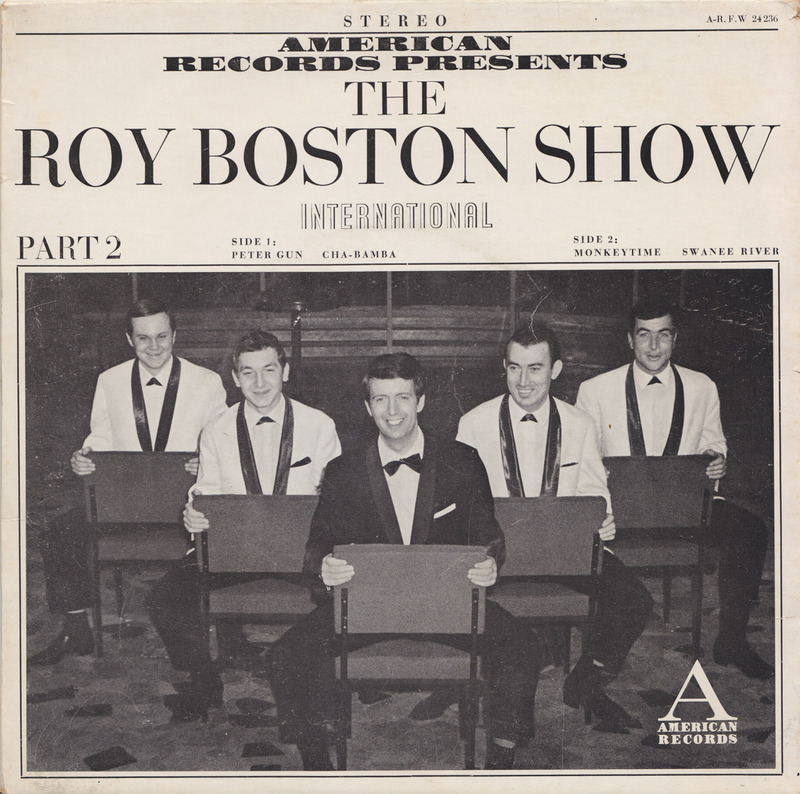 Here, with an excerpt from his show, the singer Roy Boston presents his band. 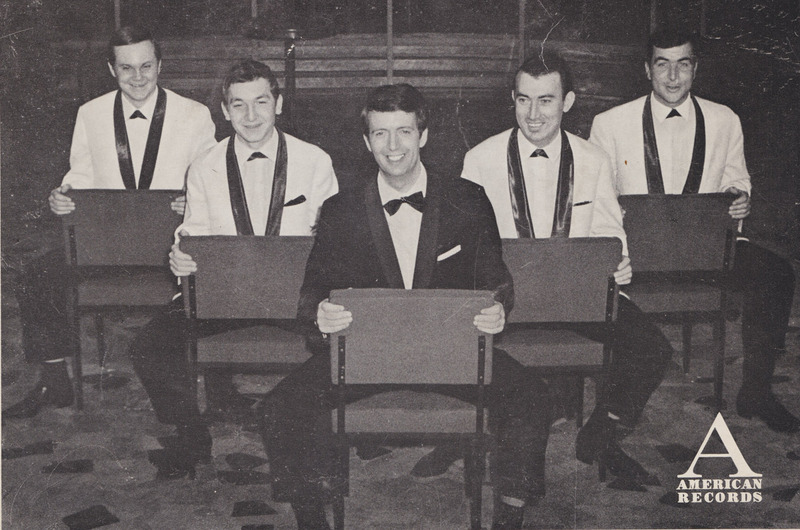 It is a pleasure to hear and see this young band sing and play. Unfortunately, there is no gold metal for versatality. They harmonize in seven languages and in all kinds of styles from Bamba, Chacha, Calypso, Swing, Twist, Slop and Blues to Tango, Waltz, Polka and March. And further, from German songs of the Rhineland to the Spirituals and Folk songs of America. This great versatality is explained by Roy Boston´s enthusiasm for travel and study. In television and recording studios, american clubs, in London´s exclusive Docklands Settlement Club, before Paul Getty, the richest man in the world, Princess Margaret, Lord Snowden and in the women´s clubs of Montreal, American Air Force clubs, on luxury liners, in the Orient and in Europe, he has learned what show business is and how it is done. Monkey Time will be feautured on the next issue of “Scratching the Beer Beat Barrel” coming in a few days. Thx a lot mate und beste Grüße dall’Italia! any idea bout the year? Sorry, no idea. By the look and the haircuts, I´d guess 1966. Conservatively 1968.